Hmm. What do you do on a cold, windy, cloudy morning? 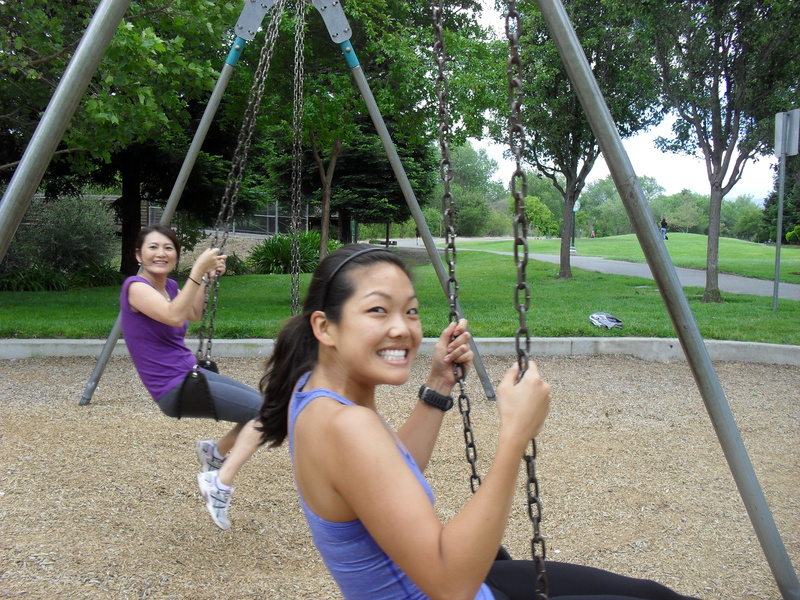 You take a couple friends and head to the park! Jane, Addie, and I met up, ready to spend all morning and part of the afternoon together. 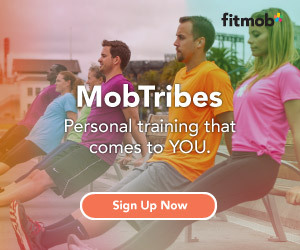 I am pretty much their beloved trainer, so I made sure we did some things to kick their butts. 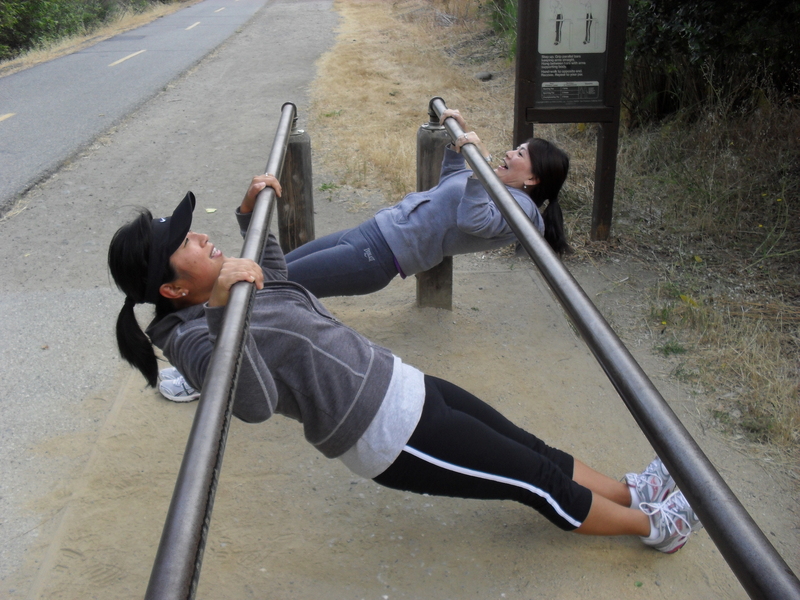 The Los Gatos Creek Trail has a portion from the Campbell Park with little areas along the route for doing other exercises, so we had some fun along the way. 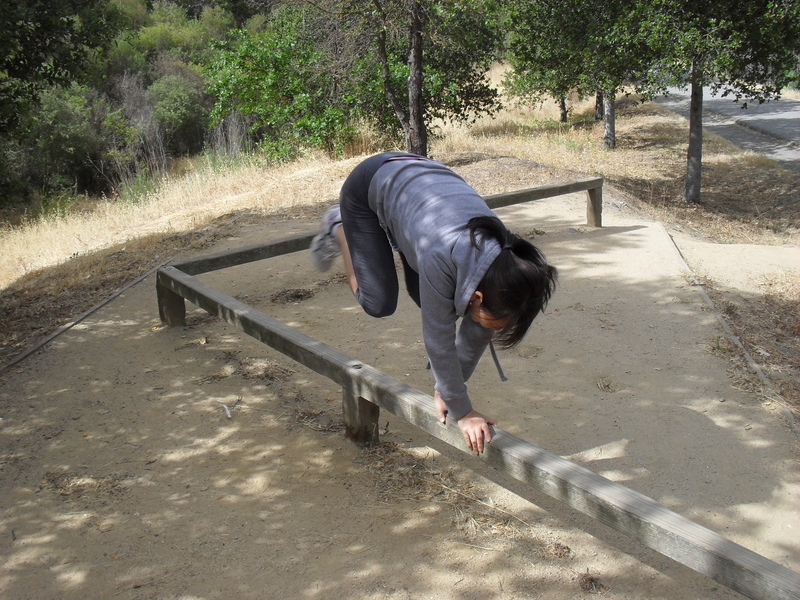 Here is Jane, hopping over the wooden plank thing (we did 20 consecutively). Here’s Addie showing us how to do a one-legged tricep dip! 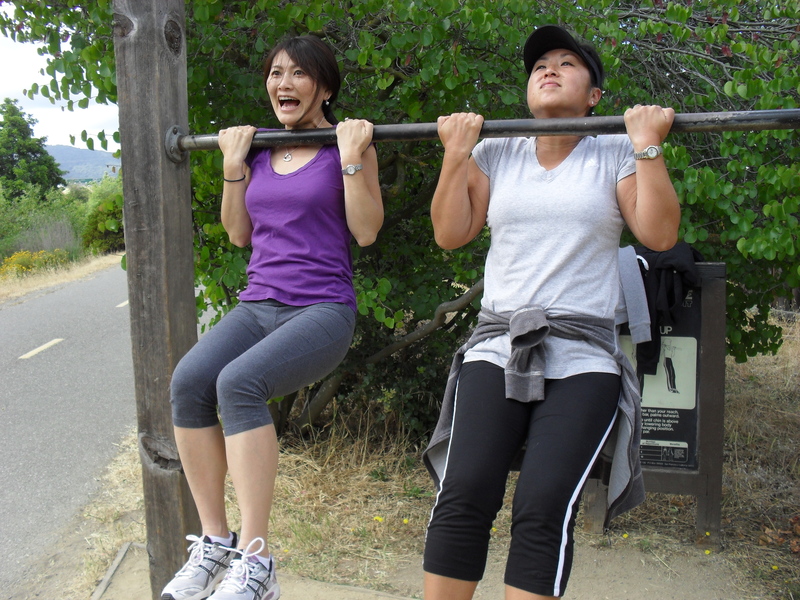 ^We used it to bust out some modified chin-ups (it’s hard for women to do chin-ups, so this is one way to work up to the real thing. Keep your core tight and squeeze your shoulder blades together as you pull up). 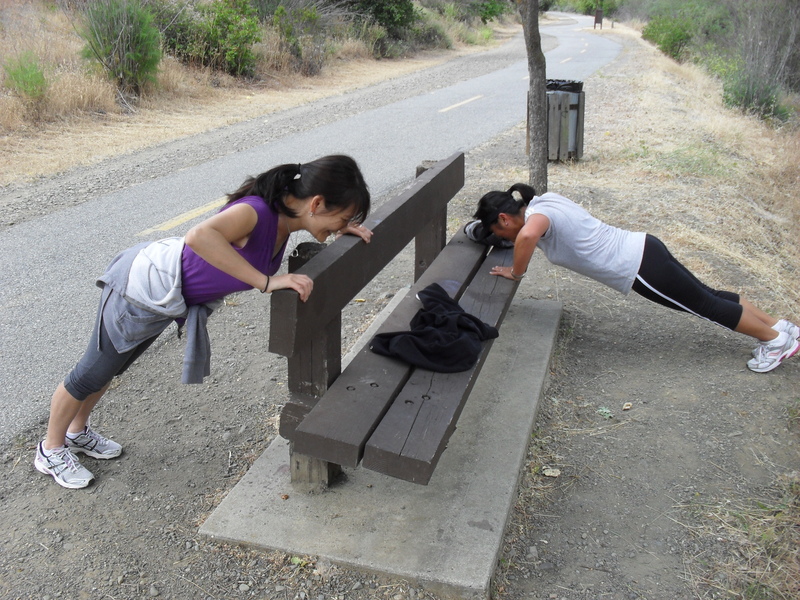 Standard pushups (using the bench like this makes it easier). Jane, you are on the wrong side of the bench, girl! Hahaha. We did some ab work (just engage core and pull legs up. Try to keep them straight and don’t arch your back like crazy while you’re doing it). Awkward smirk is optional. If you need to rest, just have a seat like me. JANE! Why you on the ground?? Hehe (she already held it for a little bit…). 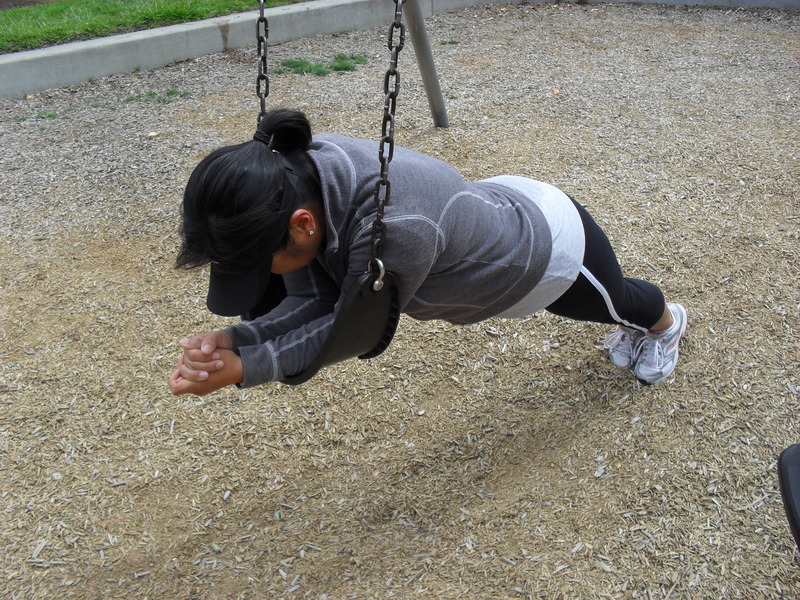 The swings were available so we did some plank holds (since it’s not an even surface, you will be shaking a bit). As always, core tight and shoulders over the wrists. We did some lunges with the back foot on the seat as well. Then we used it for its real purpose and swung for a bit. I’m so very nice. 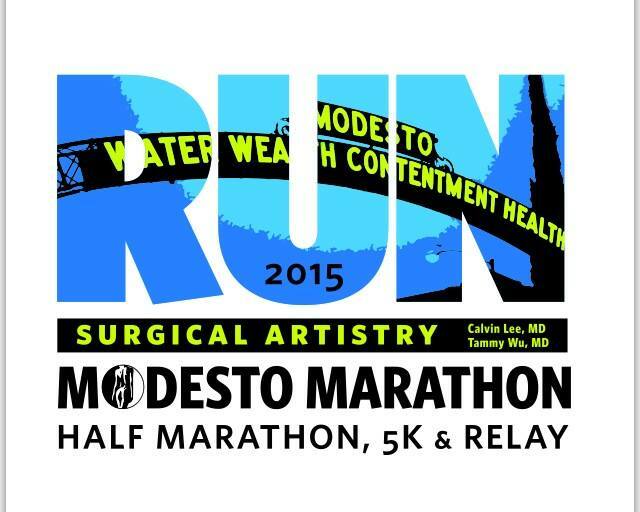 In total, we ran/walked 2.25 miles and did plenty of other fun exercises along the way! After our workout, we went to a thrift store and got all thrifty. It was 50% off everything today! I got an orange hoodie (with earphones built into it!!) and Asics shorts for a total of $3.60. DID I JUST ROB THE SALVATION ARMY STORE??? It sure feels like it. That’s cheaper than a Matcha green tea Freddo! Actually, Jane and Addie were the ones to find those for me. I was so hungry and super-noob, so I couldn’t really spot the good items. Thank you ladies for the great finds! I was telling Addie that she could always get this one and pack the leftover. She was smart and got the side salad size… and I just ate my whole order. So much fiber… it didn’t hit me until we stood up and walked outside. Not to worry! There’s always room for coffee and desserts! We went to the Olin Market inside of Santana Row and went a little crazy with all the different chocolates they have there. We each tried a bit of everything and it was so fun and delicious! BTW, this stuff is really good, but it’s super sweet. I was only able to each about one inch of it with coffee before packing the rest for later. We talked about something interesting while enjoying all these decadent desserts. I realized yesterday, during the sisters’ Bible study small group, that it’s better to just eat a bit of the full-fat, regular version of something than try to substitute it with the fat-free version. Last night, I had a granola bar in my purse, but what I really wanted were the chocolate macarons I bought from Trader Joe’s. I decided to just have half of one and it ended up satisfying my sweet tooth! Guess what would have happened if I just ate the granola bar instead… I would have ended up eating the macaron anyways, and then probably feel all bad about myself and eat another one (saying “Great, I’ve blown it anyways. Might as well eat it all!”). I loved the SWIM QT today. It was from Exodus 26:1-14, and it was about God’s instructions on how to make the curtains for the tabernacle. He used goat and ram skins, different colored yarn, and had it made for the holy and sacred tabernacle! What was flippin’ amazing was the fact that in the chapter right before it, He asks for anyone to offer (out of the willingness in their hearts) any blue/purple/scarlet yarn, skins, etc. Who would have thought that someone owning some purple yarn would know that it would end up being part of something so sacred? Sometimes when we give something willingly to God, it may appear to be insignificant and small (a ball of purple yarn)… but who knows? Maybe He’ll combine our offering with others’ offerings and be able to create something amazing (the curtains for the tabernacle!)!! So whatever it may be, give it willingly to the Lord. <– I’m trying to say this to myself, too. I struggle all the time with wanting to keep my stupid ball of purple yarn. Do you ever shop at the thrift store?